What a gratin this is, truly. I love how the individual fall-rainbow colors remain distinct -- the white of turnip, the gold of rutabaga, the orange of sweet potato. And yet the flavors stand alone and still meld together, married by sweet sautéed leek and a light cheese sauce. How to clean leeks: Leeks collect grit between their layers. Luckily, cleaning them is easy. First slice off the dense part of the root end, crosswise. Remove any outer layers that are thick and tough. Then slice off the leaf end, just where it looks like the 'white' ends and the 'green' begins. The cut piece will probably be six inches to twelve inches long. Now cut the leek in half, lengthwise. Wash each half under running water, using your hand to loosely separate but still gather the layers. Cut leek halves crosswise into 1/2 inch half-rounds for sauteeing. Then, take the leaf end and remove another layer or two. Inside you'll find a tender 'light green' part that can also be cut into half-rounds for sauteeing. In a large skillet or Dutch oven, melt the butter on MEDIUM, add the leeks and cook, stirring often, till soft. Set aside. In the skillet or Dutch oven used for the leeks, melt the butter on MEDIUM. Stir in the flour, removing all the lumps. A spoonful at a time at first, slowly stir in the milk, stirring all the time to remove all the lumps, not adding more til the lumps are stirred out. (Press with the back of a spoon if needed.) Add the apple cider. Stirring often, cook til the sauce thickens. 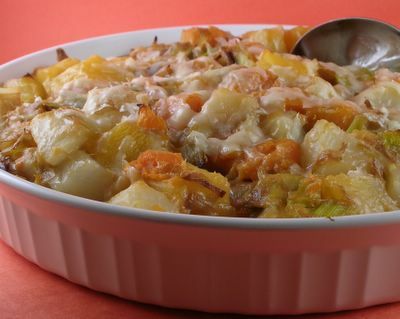 Stir in the cheese, the sauteed leeks and the cooked root vegetables. (You could also melt the cheese in the sauce but I really liked finding tiny pockets of cheese amid the chunks of vegetables.) Transfer to a baking dish. Let cool, cover and refrigerate. Return to room temperature. Preheat oven to 375F. Uncover gratin and bake for 30 minutes or until hot and bubbly throughout. Top with Parmesan and bake another 15 minutes. That looks incredible. I can't have cow cheese, but I bet there's a sheep cheese that would work well enough. I love gratins that can be a vegetarian main course -- that's usually the route we go for holidays when our kids are visiting. This one looks delicious. Mm, that looks great! Thanks! I just made this and I am wondering if the amount of liquid for making the white sauce is correct as posted (1/3 cup milk, 1/3 cup cider)? I had to keep adding more milk, in order to keep the liquid from cooking off before the flour could cook, and in order to make more than a tablespoon or two of sauce. It was tasty in the end, though. Hi Anonymous ~ It's been over a year since I made this dish so can't say for sure. That said, I always proof recipes at least once when writing them. THAT said, the usual proportions are 1T fat to 1T flour to 1C liquid so thanks for the heads up that it might take a little more liquid. Glad it turned out tasty, I do remember loving that part! I made this exact recipe last Thanksgiving and there is no greater Thanksgiving side dish. It fits perfectly the fall vegetable squash pilgrim/indian concept of Thanksgiving, as well as being one of the most delicious dishes I have ever had. Only for those who prefer their Thanksgiving to be very, very special though!